This page lists all their current special offers, deals and sometimes coupons. 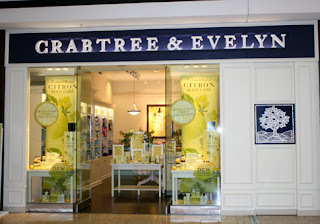 Enter your email address to sign up and receive future coupons and exclusive from Crabtree & Evelyn stores. Spend over $75 at crabtree and evelyn stores and get $20 off. Celebrating friends and family. Get 25% off everything. Print out the whole email. Purchase any one 100g Hand Therapy for $14 (regularly priced $22) at participating Crabtree & Evelyn full-line stores, Outlet stores. Free Raspberry Nail Lacquer (reg. $8) with purchase of $40..
Redeem this 20% coupon on your choice of one full-price, full-size item from the Men's Collection.. Receive free Indian Sandalwood or Moroccan Myrrh 50mL After Shave Balm (reg. $16) with a purchase of $50..
Print coupon for 15% off $45, 20% off $65, or 25% off $100 at Crabtree & Evelyn. Must be a Platinum Rewards Member - Free to join. Friends & Family Savings Event..